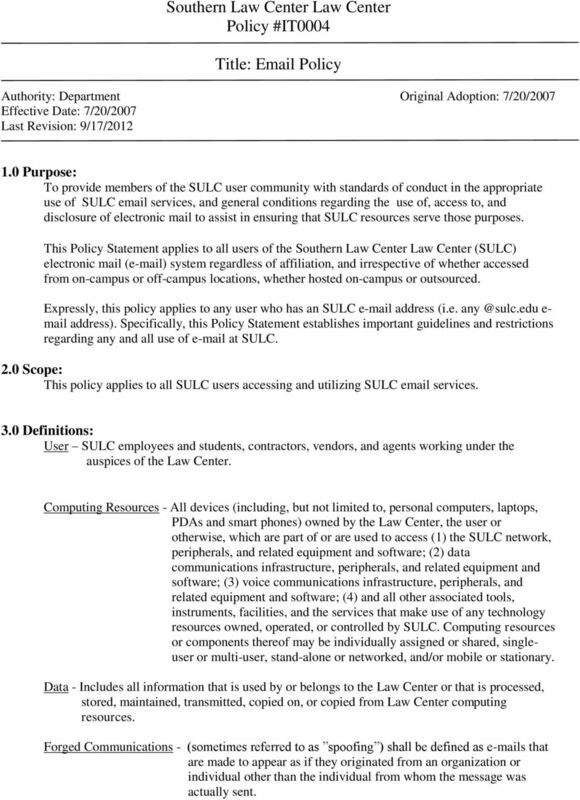 Download "Southern Law Center Law Center Policy #IT0004. Title: Email Policy"
1 Southern Law Center Law Center Policy #IT0004 Title: Policy Authority: Department Original Adoption: 7/20/2007 Effective Date: 7/20/2007 Last Revision: 9/17/ Purpose: To provide members of the SULC user community with standards of conduct in the appropriate use of SULC services, and general conditions regarding the use of, access to, and disclosure of electronic mail to assist in ensuring that SULC resources serve those purposes. 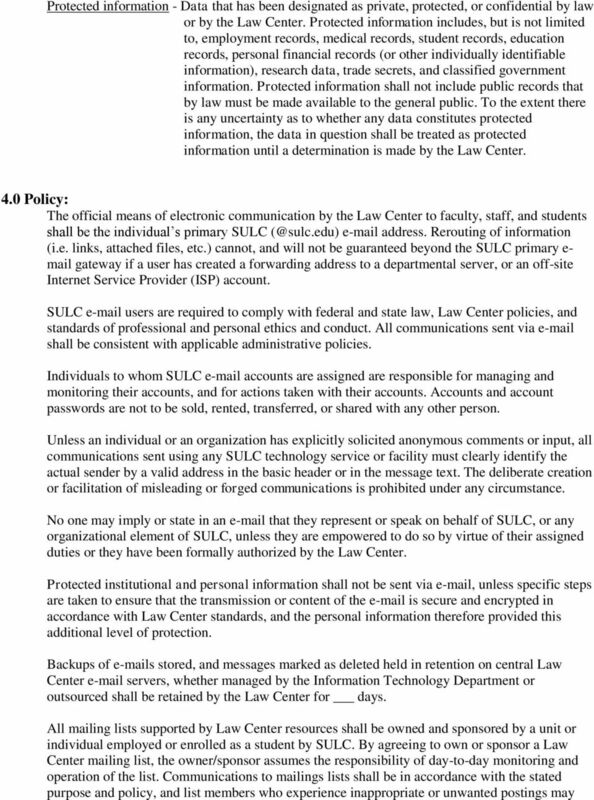 This Policy Statement applies to all users of the Southern Law Center Law Center (SULC) electronic mail ( ) system regardless of affiliation, and irrespective of whether accessed from on-campus or off-campus locations, whether hosted on-campus or outsourced. Expressly, this policy applies to any user who has an SULC address (i.e. e- mail address). Specifically, this Policy Statement establishes important guidelines and restrictions regarding any and all use of at SULC. 2.0 Scope: This policy applies to all SULC users accessing and utilizing SULC services. 3.0 Definitions: User SULC employees and students, contractors, vendors, and agents working under the auspices of the Law Center. Computing Resources - All devices (including, but not limited to, personal computers, laptops, PDAs and smart phones) owned by the Law Center, the user or otherwise, which are part of or are used to access (1) the SULC network, peripherals, and related equipment and software; (2) data communications infrastructure, peripherals, and related equipment and software; (3) voice communications infrastructure, peripherals, and related equipment and software; (4) and all other associated tools, instruments, facilities, and the services that make use of any technology resources owned, operated, or controlled by SULC. Computing resources or components thereof may be individually assigned or shared, singleuser or multi-user, stand-alone or networked, and/or mobile or stationary. Data - Includes all information that is used by or belongs to the Law Center or that is processed, stored, maintained, transmitted, copied on, or copied from Law Center computing resources. Forged Communications - (sometimes referred to as spoofing ) shall be defined as s that are made to appear as if they originated from an organization or individual other than the individual from whom the message was actually sent. 4 message will be sent to the user when % of the mailbox storage limit is reached. If the user reaches the designated amount of server side storage for , he/she will no longer be able to send new messages. Once a user exceeds the designated amount of server side storage for , the user will no longer be able to send or receive , and any messages sent to the user s mailbox will be rejected. Users that require additional storage space can utilize Personal Folders to archive the additional to files on desktops or laptops. Law Center employees should archive all s which constitute public records and retain them for three (3) years from creation. Duplicates need not be retained. Public records relating to purchases under the Procurement Code are required to be retained for six (6) years. Privacy and Applicability of Laws and Policies This policy clarifies the applicability of law and certain other Law Center policies to e- mail. 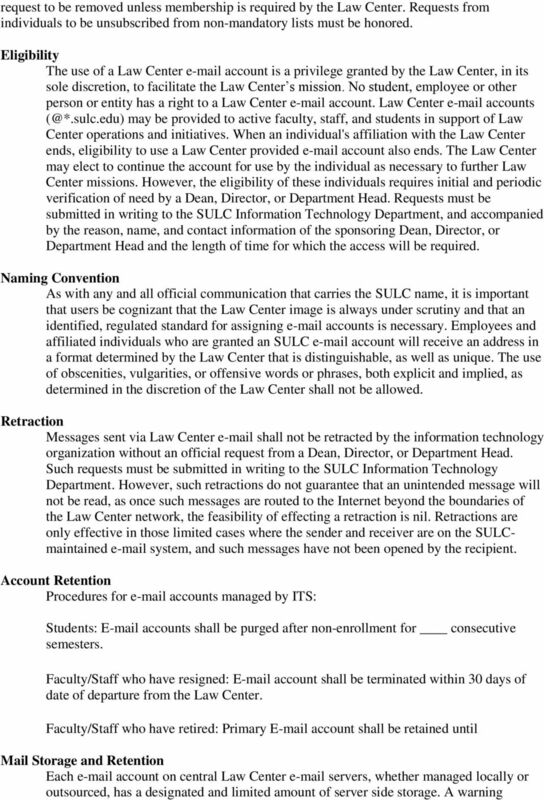 Users are reminded that usage of SULC s computing resources, including , is subject to all Law Center policies. The Law Center encourages the use of , respects the privacy of users, and does not wish to inspect or monitor routinely, or to be the arbiter of its contents. Nonetheless, and data stored on the Law Center's network of computers is the property of the Law Center and is accessed by the Law Center for the following purposes: Routine backups Troubleshooting hardware and software problems Preventing unauthorized access and system misuse Retrieving business related information* Investigating potential violation of Law Center policy or local, state or federal law* Complying with legal requests for information* Rerouting or disposing of undeliverable mail Conducting Law Center business Other purposes deemed necessary by the Law Center Information Technology Department, with the Law Center Chancellor s approval. *Approval required by one or more of the following Law Center parties: Law Center Counsel, Law Center Chancellor, Law Enforcement, and the Southern University System Internal Auditor. The extent of the access will be limited to what is reasonably necessary to acquire the information. Individual users should have no expectation of personal privacy or confidentiality for documents and messages stored on Law Center-owned equipment or systems. Users of e- mail services must be aware that even if the sender and recipient have discarded their copies of an record, there might be back-up copies of such that can be retrieved. may constitute a public record like other documents subject to disclosure as such or as a result of litigation. However, prior to any such disclosure, the Law Center must evaluate all requests for information for compliance with applicable federal and state law. Any public records requests or subpoenas or other court orders which could include a user s should be sent to the Law Center s Chancellor s Office for evaluation. 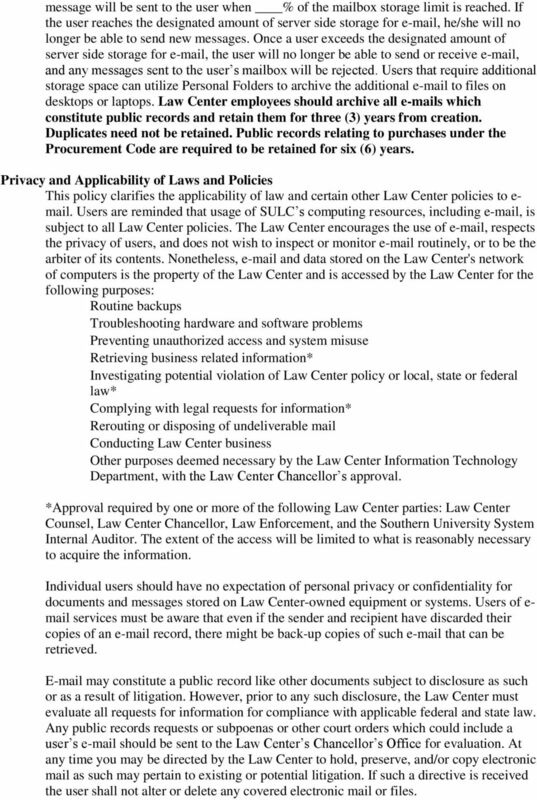 At any time you may be directed by the Law Center to hold, preserve, and/or copy electronic mail as such may pertain to existing or potential litigation. If such a directive is received the user shall not alter or delete any covered electronic mail or files. 5 Acceptable Use of SULC Services The acceptable use of SULCS services shall be governed by the provisions defined within the SULC Acceptable Use Policy (Policy #IT0001) INCIDENT HANDLING All security incidents or concerns regarding or other technology policies must be reported immediately to the SULC Information Technology Department. After verification is complete using system or other logs, and in accordance with other applicable policies and procedures, the incident will be reported to the appropriate Dean, Director, or Department Head for review and possible action. 1.0 Overview Keuka College provides access to modern information technology in support of its mission to promote excellence and achievement across its mission areas of instruction, research, and service. 5. Users of ITS are the persons described above under Policy Application of the diocese of Springfield in Illinois. VICTOR VALLEY COMMUNITY COLLEGE DISTRICT ADMINISTRATIVE PROCEDURE. Computer Use - Computer and Electronic Communication Systems. Clear Creek ISD 084910 CQ (REGULATION) SCOPE CONSENT REQUIREMENTS CHIEF TECHNOLOGY OFFICER RESPONSIBILITIES The Superintendent or designee will oversee the District s electronic communications system. 8 Securities Limited ( 8Sec ) reserves the right to update and change the TOS from time to time without notice or acceptance by you. 2. Prohibit and prevent unauthorized online disclosure, use, or dissemination of personally identifiable information of students.